Here are three steps to successful trade show graphics. Trade shows are a great way to network, boost your branding, and even draw in new customers. It’s important to bring a great first impression to a trade show through your booth or exhibition table. A great way to get the attention of other industry professionals, as well as potential new clientele, is through the use of your logo and graphic design. After all, your company’s graphics do so much more than advertise–graphics can help communicate your mission statement and brand. There are a few key points to hit with your graphic design when it comes to trade shows, and we have you covered. Here are three steps to successful trade show graphics. First and foremost, you want to be sure your trade show graphics communicate with customers and fellow professionals alike. Through effective use of your logo and appealing graphic design, you can promote a positive, memorable image that will stick with attendees long after the trade show. 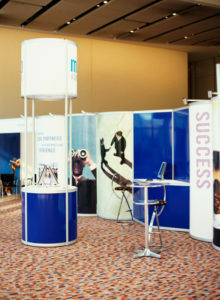 Your trade show graphics should keep your audience in mind as well as your business’s aesthetic. Think of the key demographics you will reach during the trade show and let that help shape your design choices. When it comes to grabbing the attention of passersby, appealing and well-designed graphics are key. It’s important to use relevant imagery to help with branding and help audiences understand your business. You’ll also want to consider concepts like contrast which will help distinguish your graphic materials from all the other businesses and booths at a trade show. This doesn’t just have to do with getting people to stop at your booth; it also applies to the flow of your graphics and text, and how understandable your materials are. Consider what people will see first and how clear all your materials are. Successful trade show graphics will not just grab the audience’s attention, but keep it as well. By establishing a flow from simple long-range graphics that are easily recognizable and make your location known, to short-range graphics with more intricate graphics and long-form text, you can help keep interest high as people approach your booth and learn more about your business. This can be as simple as placing branding materials at eye-level over your table. If you are looking for a cool custom way to advertise your business, make sure to check out Brand It, Wrap It, Custom Signs and Vehicle Graphics. We are a full-service sign and wrap company that provides excellent quality signage for businesses both big and small throughout the Maryland, Virginia, and Washington, D.C. metro area. We provide awesome customer service, use the best and latest sign printing technology, and pride ourselves on our attention to detail. To see how we can help your business shine, give us a call at 301-838-9727 or visit us online for an estimate. For more tips and articles like this, follow us on Facebook, Twitter, Google+ Pinterest, and Instagram. This entry was posted on Monday, March 18th, 2019 at 11:44 am. Both comments and pings are currently closed.